Raymond Mearns is a Glaswegian comedian, TV and film actor. 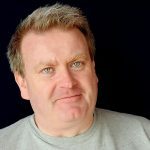 Whether he is engaged in super quick audience interaction or telling a hilarious shaggy dog story, Raymond Mearns is one of the UK’s finest circuit comedians. With a blinding talent for improvisation, Raymond is renowned as one of the nations top comperes and this is underlined by the fact he is a regular at the nations top comedy venues!